For the genus of snails, see Bithynia (gastropod). Bithynia (/bɪˈθɪniə/; Koine Greek: Βιθυνία, Bithynía) was an ancient region, kingdom and Roman province in the northwest of Asia Minor, adjoining the Propontis, the Thracian Bosporus and the Euxine Sea. It bordered Mysia to the southwest, Paphlagonia to the northeast along the Pontic coast, and Phrygia to the southeast towards the interior of Asia Minor. Bithynia was an independent kingdom from the 4th century BC. 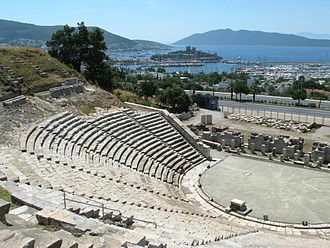 Its capital Nicomedia was rebuilt on the site of ancient Astacus in 264 BC by Nicomedes I of Bithynia. Bithynia was bequeathed to the Roman Republic in 74 BC, and became united with the Pontus region as the province of Bithynia et Pontus. 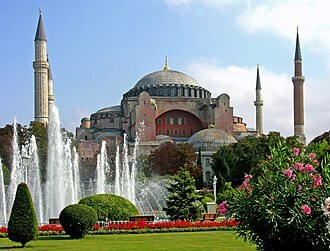 In the 7th century it was incorporated into the Byzantine Opsikion theme. 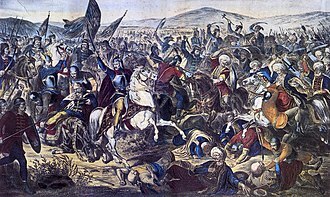 It became a border region to the Seljuk Empire in the 13th century, and was eventually conquered by the Ottoman Turks between 1325 and 1333. Several major cities sat on the fertile shores of the Propontis (which is now known as Sea of Marmara): Nicomedia, Chalcedon, Cius and Apamea. Bithynia also contained Nicaea, noted for being the birthplace of the Nicene Creed. According to Strabo, Bithynia was bounded on the east by the river Sangarius (modern Sakarya river), but the more commonly received division extended it to the Parthenius, which river separated it from Paphlagonia, thus comprising the district inhabited by the Mariandyni. On the west and southwest it was separated from Mysia by the river Rhyndacus and on the south it adjoined Phrygia and Galatia. 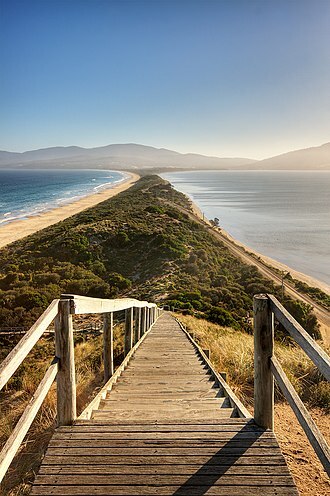 It is occupied by mountains and forests, but has valleys and coastal districts of great fertility. The most important mountain range is the (so-called) "Mysian" Olympus (8000 ft., 2500 m), which towers above Bursa and is clearly visible as far away as Istanbul (70 miles, 113 km). Its summits are covered with snow for a great part of the year. East of this the range extends for more than 100 miles (160 km), from the Sakarya to Paphlagonia. Both of these ranges are part of the border of mountains which bound the great tableland of Anatolia, Turkey. The broad tract which projects towards the west as far as the shores of the Bosporus, though hilly and covered with forests — the Turkish Ağaç Denizi, or "The Ocean of Trees" — is not traversed by any mountain chain. The west coast is indented by two deep inlets, the northernmost, the Gulf of İzmit (ancient Gulf of Astacus), penetrating between 40 and 50 miles (65–80 km) into the interior as far as İzmit (ancient Nicomedia), separated by an isthmus of only about 25 miles (40 km) from the Black Sea; and the Gulf of Mudanya or Gemlik (Gulf of Cius), about 25 miles (40 km) long. At its extremity is situated the small town of Gemlik (ancient Cius) at the mouth of a valley, communicating with the lake of Iznik, on which was situated Nicaea. The principal rivers are the Sangarios which traverses the province from down to north; the Rhyndacus, which separated it from Mysia; and the Billaeus (Filyos), which rises in the Aladağ, about 50 miles (80 km) from the sea, and after flowing by modern Bolu (ancient Bithynion-Claudiopolis) falls into the Euxine, close to the ruins of the ancient Tium, about 40 miles (64 km) northeast of Heraclea Pontica (the modern Karadeniz Ereğli), having a course of more than 100 miles (160 km). The Parthenius (modern Bartın), the eastern boundary of the province, is a much less considerable stream. The valleys towards the Black Sea abound in fruit trees of all kinds, such as oranges, while the valley of the Sangarius and the plains near Bursa and Iznik (Nicaea) are fertile and well cultivated. Extensive plantations of mulberry trees supply the silk for which Bursa has long been celebrated, and which is manufactured there on a large scale. Photo of a 15th-century map showing Bithynia. Bithynia is named for the Thracian tribe of the Bithyni, mentioned by Herodotus (VII.75) alongside the Thyni. 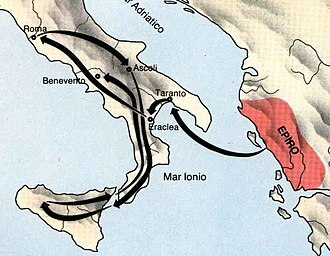 The "Thraco-Phrygian" migration from the Balkans to Asia Minor would have taken place at some point following the Bronze Age collapse or during the early Iron Age. The Thyni and Bithyni appear to have settled simultaneously in the adjoining parts of Asia, where they expelled or subdued the Mysians, Caucones and other minor tribes, the Mariandyni maintaining themselves in the northeast. Herodotus mentions the Thyni and Bithyni as settling side by side. No trace of their original language has been preserved, but Herodotus describes them as related to the tribes of Thracian extraction like the Phrygians and Armenians, whose languages form part of the Paleo-Balkan group. Later the Greeks established on the coast the colonies of Cius (modern Gemlik); Chalcedon (modern Kadıköy), at the entrance of the Bosporus, nearly opposite Byzantium (modern Istanbul) and Heraclea Pontica (modern Karadeniz Ereğli), on the Euxine, about 120 miles (190 km) east of the Bosporus. The Bithynians were incorporated by king Croesus within the Lydian monarchy, with which they fell under the dominion of Persia (546 BC), and were included in the satrapy of Phrygia, which comprised all the countries up to the Hellespont and Bosporus. Even before the conquest by Alexander the Bithynians appear to have asserted their independence, and successfully maintained it under two native princes, Bas and Zipoites, the latter of whom assumed the title of king (basileus) in 297 BC. His son and successor, Nicomedes I, founded Nicomedia, which soon rose to great prosperity, and during his long reign (c. 278 – c. 255 BC), as well as those of his successors, Prusias I, Prusias II and Nicomedes II (149 – 91 BC), the kingdom of Bithynia had a considerable standing and influence among the minor monarchies of Anatolia. But the last king, Nicomedes IV, was unable to maintain himself in power against Mithridates VI of Pontus. After being restored to his throne by the Roman Senate, he bequeathed his kingdom through his will to the Roman republic (74 BC). The coinage of these kings show their regal portraits, which tend to be engraved in an extremely accomplished Hellenistic style. As a Roman province, the boundaries of Bithynia changed frequently. During this period, Bithynia was commonly united for administrative purposes with the province of Pontus. This was the situation at the time of Emperor Trajan, when Pliny the Younger was appointed governor of the combined provinces (109/110 – 111/112), a circumstance which has provided historians with valuable information concerning the Roman provincial administration at that time. Under the Byzantine Empire, Bithynia was again divided into two provinces, separated by the Sangarius. Only the area to the west of the river retained the name of Bithynia. Bithynia attracted much attention because of its roads and its strategic position between the frontiers of the Danube in the north and the Euphrates in the south-east. To secure communications with the eastern provinces, the monumental bridge across the river Sangarius was constructed around 562 AD. 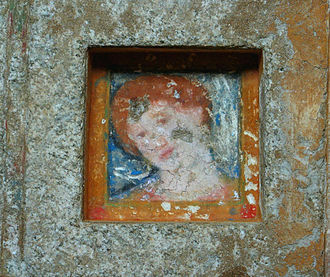 Troops frequently wintered at Nicomedia. During this time, the most important cities in Bithynia were Nicomedia, founded by Nicomedes, and Nicaea. The two had a long rivalry with each other over which city held the rank of capital. ^ a b c d e f g Chisholm 1911, p. 12. ^ a b c Chisholm 1911, p. 13. This article incorporates text from a publication now in the public domain: Chisholm, Hugh, ed. (1911). "Bithynia" . Encyclopædia Britannica. 4 (11th ed.). Cambridge University Press. pp. 12–13. Storey, Stanley Jonathon (1999) . Bithynia: history and administration to the time of Pliny the Younger (PDF). Ottawa: National Library of Canada. ISBN 0-612-34324-3. Retrieved 2007-05-21. The Bosphorus strait connects it to the Black Sea and the Dardanelles strait to the Aegean Sea. The former separates Istanbul into its Asian and European sides, the sea has an area of 11,350 km² with the greatest depth reaching 1,370 m. The sea takes its name from the island of Marmara, which is rich in sources of marble, from the Greek μάρμαρον, marble. The seas ancient Greek name Propontis derives from pro- and pontos, deriving from the fact that the Greeks sailed through it to reach the Black Sea, Pontos. The surface salinity of the sea averages about 22 parts per thousand, which is greater than that of the Black Sea. The water is more saline at the sea bottom, averaging salinities of around 38 parts per thousand. This high-density saline water, like that of the Black Sea, water from the Susurluk and Gonen Rivers reduces the salinity of the sea, though with less influence than on the Black Sea. With little land in Thrace draining southward, almost all of these rivers flow from Anatolia, the sea contains the archipelago of the Prince Islands and Marmara Island, Avşa and Paşalimanı. 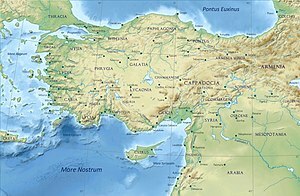 Ancient Galatia was an area in the highlands of central Anatolia in modern Turkey. Galatia was named for the immigrant Gauls from Thrace, who settled here and became its ruling caste in the 3rd century BC and it has been called the Gallia of the East, Roman writers calling its inhabitants Galli. Galatia was bounded on the north by Bithynia and Paphlagonia, on the east by Pontus and Cappadocia, on the south by Cilicia and Lycaonia, the Galatians originated as a part of the great Celtic migration, which invaded Macedon, led by Brennus. 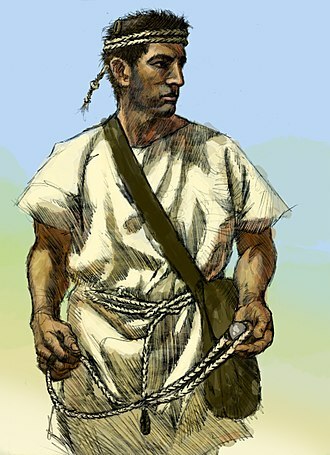 The original Celts who settled in Galatia came through Thrace under the leadership of Leotarios and Leonnorios c and these Celts consisted of three tribes, the Tectosages, the Trocmii, and the Tolistobogii. Brennus invaded Greece in 281 BC with a war band. At the same time, another Gaulish group of men and this had split off from Brennus people in 279 BC, and had migrated into Thrace under its leaders Leonnorius and Lutarius. The invaders came at the invitation of Nicomedes I of Bithynia, three tribes crossed over from Thrace to Asia Minor. 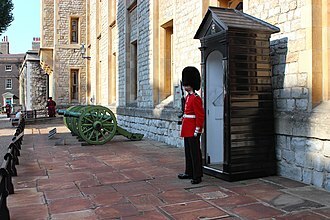 They numbered about 10,000 fighting men and about the number of women and children. They were eventually defeated by the Seleucid king Antiochus I, in a battle where the Seleucid war elephants shocked the Celts, while the momentum of the invasion was broken, the Galatians were by no means exterminated. 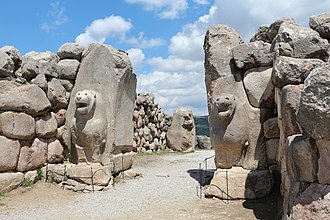 Instead, the led to the establishment of a long-lived Celtic territory in central Anatolia, which included the eastern part of ancient Phrygia. There they ultimately settled, and strengthened by fresh accessions of the clan from Europe, they overran Bithynia. The Gauls invaded eastern Phrygia on at least one occasion and it is likely it was a sacred oak grove, since the name means sanctuary of the oaks. These Celtic warriors were respected by Greeks and Romans and they were often hired as mercenary soldiers, sometimes fighting on both sides in the great battles of the times. For years, the chieftains and their war bands ravaged the western half of Asia Minor, as allies of one or other of the warring princes, without any serious check. The Opsician Theme or simply Opsikion was a Byzantine theme located in northwestern Asia Minor. Created from the imperial army, the Opsikion was the largest and most prestigious of the early themes. Involved in several revolts in the 8th century, it was split in three after ca,750, and lost its former pre-eminence. It survived as a theme until after the Fourth Crusade. The Opsician theme was one of the first four themes, and has its origin in the armies of the East Roman army. The term Opsikion derives from the Latin term Obsequium, which by the early 7th century came to refer to the units escorting the emperor on campaign and it is possible that at an early stage, the Opsikion was garrisoned inside Constantinople itself. Thus the Opsician theme was the area where the imperial Opsikion was settled, the exact date of the themes establishment is unknown, the earliest reference points to a creation as early as 626, but the first confirmed occurrence is in 680. It is possible that it initially included the area of Thrace. The unique origin of the Opsikion was reflected in several aspects of the themes organization, thus the title of its commander was not stratēgos as with the other themes, but komēs, in full komēs tou basilikou Opsikiou. Its prestige is further illustrated by the seals of its commanders, already in 668, on the death of Emperor Constans II in Sicily, the count Mezezius staged an abortive coup. Under the patrikios Barasbakourios, the Opsikion was the main power-base of Emperor Justinian II, Justinian II settled many Slavs captured in Thrace there, in an attempt to boost its military strength. Most of them, deserted to the Arabs on the first battle, in 717, the Opsicians supported the rise of Leo III the Isaurian to the throne, but in 718, their count, the patrikios Isoes, rose up unsuccessfully against him. 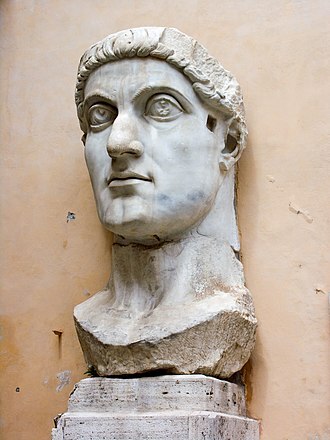 In 741–742, the kouropalatēs Artabasdos used the theme as a base for his usurpation of Emperor Constantine V. In 766, another count was blinded after a mutiny against the same emperor. As a result, Emperor Constantine V set out to weaken the power by splitting off the new themes of the Boukellarioi. Mysia was a region in the northwest of ancient Asia Minor or Anatolia. It was located on the south coast of the Sea of Marmara and it was bounded by Bithynia on the east, Phrygia on the southeast, Lydia on the south, Aeolis on the southwest, Troad on the west and by the Propontis on the north. In ancient times it was inhabited by the Mysians, Aeolian Greeks, the precise limits of Mysia are difficult to assign. The Phrygian frontier was fluctuating, while in the northwest the Troad was only included in Mysia. 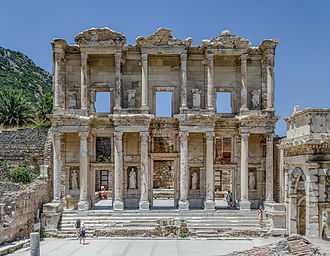 The northern portion was known as Lesser Phrygia or Phrygia Minor, Mysia was in times known as Phrygia Hellespontica or Phrygia Epictetus, so named by the Attalids when they annexed the region to the Kingdom of Pergamon. The Caïcus in the rises in Temnus, and from thence flows westward to the Aegean Sea. In the northern portion of the province are two lakes, Artynia or Apolloniatis and Aphnitis, which discharge their waters into the Macestus from the east and west respectively. The most important cities were Pergamon in the valley of the Caïcus, further south, on the Eleatic Gulf, were Elaea and Cyme. A minor episode in the Trojan War cycle in Greek mythology has the Greek fleet land at Mysia, Achilles wounds their king, after he slays a Greek, Telephus pleads with Achilles to heal the wound. 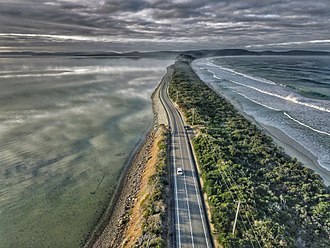 This coastal region ruled by Telephus is alternatively named Teuthrania in Greek mythology, in the Iliad, Homer represents the Mysians as allies of Troy, with the Mysian forces led by Ennomus and Chromius, sons of Arsinous. Homeric Mysia appears to have much smaller in extent than historical Mysia. Homer does not mention any cities or landmarks in Mysia, and it is not clear exactly where Homeric Mysia was situated, there are a number of Mysian inscriptions in a dialect of the Phrygian language, in a variant of the Phrygian alphabet. 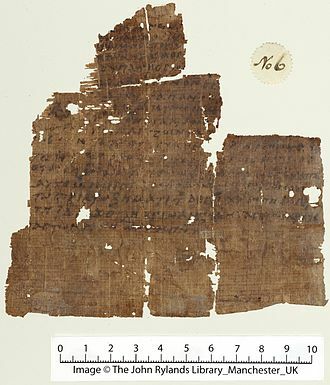 There are a number of references to a Lutescan language indigenous to Mysia in Aeolic Greek sources. According to the Acts of the Apostles, the apostles Paul, the narrative suggests that they were uncertain where to travel during this part of the journey, being forbidden by the Holy Spirit to preach the word in Asia. Istanbul Gate, photo by Paolo Monti, 1962. The Lefke Gate, part of Nicaea's city walls. The theatre, restored by Pliny the Younger. Funerary stele from the 1st century BC. Small silver jug from Chalcedon. 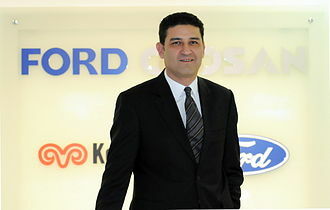 Haydar Yenigün, General Manager of Ford Otosan. Gulf of İzmit at night. 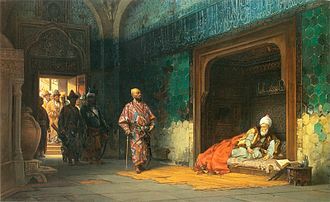 Painting by Stanisław Chlebowski, Sultan Bayezid prisoned by Timur, 1878, depicting the capture of Bayezid by Timur.